Earn up to 25,600 reward points. Piano and bench package, special deal. 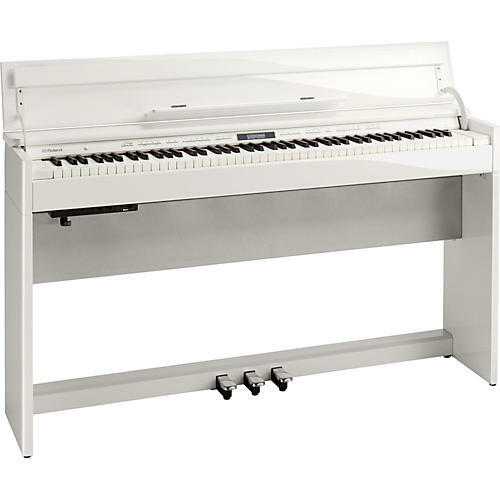 This package contains Roland’s new DP603 home digital piano and the matching bench in white. It is a bold, fresh and clean look, ideal for the modern home. When you’ve perfected the look in your home, put on the crowning jewel with the Roland DP603, a digital piano whose stylish cabinet is the perfect match for your modern living space. The DP603 features Roland’s SuperNATURAL Piano Modeling for rich, authentic sounds along with Roland’s expressive PHA-50 keyboard. An onboard selection of features is backed up by wireless connectivity to a tablet or smartphone, allowing audio playback and connectivity. Blending classic sounds with contemporary design, the Roland DP603 is perfect for the modern piano player. The DP603 linear cabinet design keeps curves and embellishments to a minimum. An integrated keyboard lid opens to provide an elegant music rest, and closes with a safety-conscious soft-fall motion. Despite its compact 13.5 in. depth, the DP603 offers the acclaimed durability the DP series has enjoyed since 2003. The Roland DP603 combines its minimalist look with heavyweight onboard tech that makes it a dream to play. This latest digital piano features the same sound engine as Roland’s flagship LX/HP models, and you’ll hear the benefits of Roland’s acclaimed SuperNATURAL Piano Modeling in performance that flawlessly recreates the rich, dynamic response of an acoustic instrument. You’ll also appreciate the new PHA-50 keyboard, whose blend of wood and molded material means it plays like traditional ivory, but without the associated maintenance and expense. The DP603’s onboard speaker system projects warm, enveloping sound, with controllable volume that lets you play loudly or quietly to suit the scenario. This new piano goes even further to double as a wireless speaker system, so you won’t need to clutter your home with an additional hi-fi or stereo. Using Bluetooth wireless technology, simply connect the Roland DP603 with your smartphone or tablet, and then play back your favorite songs through the internal speakers. Order soon. Beautiful piano with matching bench.